Travel on the ETS Ipoh Sungai Petani high-speed Electric Train Services is a fast and convenient way to travel from Ipoh in Perak, to Sg. Petani in Kedah Malaysia. You could also take a bus from Ipoh to SP, but this will mean you first have to travel out to Amanjaya Bus Terminal (10 km to the north) by local bus from Medan Kidd Bus Terminal, or take a much more expensive taxi. This makes taking the train easily the best option for travel, as the railway station in Ipoh is located on the edge of the old town (within walking distance to many of the accommodation options in this popular area to stay). Please note : there are no longer any Intercity Express Trains operating on this route. 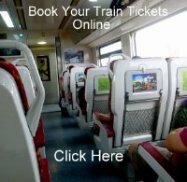 Booking train tickets in Malaysia can be done usually between a couple of weeks, to a couple of months in advance of your departure date and is highly recommended to guarantee a seat. You can book your tickets in advance from any ticket counter, at any KTMB ETS railway station.